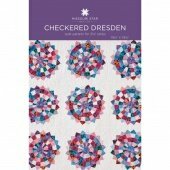 This is a beautiful play on the traditional Dresden Plate pattern. Pick a jelly roll with colors you love and we'll make magic happen! NEEDED FOR CLASS: pattern, fabrics (see below), Dresden ruler, Heat & Bond lite & Heat & Bond Hem tape . You will also need to bring your sewing machine, ¼” foot, thread, rotary cutter & mat & pins. Be sure to bring extra needles for your machine & a fresh blade for your rotary cutter, just in case you need it. If you have a pressing mat and iron, it will be helpful to bring those, as well. The store only has 2 irons and it will go very slow if everyone needs to use those. BACKGROUND FABRIC: To save 2 ½ yd. of fabric, purchase 3 ¼ yd. of background fabric, and cut your strips 21¾” instead of 22”, and you can get 2-21¾” squares from each strip, instead of 1-22” square. That ¼” will not make a difference. If your background fabric is 44” (not including the salvages), then go ahead and cut the strips 22” wide and cut 2-22” squares from each strip. You need a total of 9 squares. HOMEWORK TO BE DONE BEFORE 1st CLASS: Cut your background strips and sub-cut 9 squares. Cut & sub-cut your border fabric per directions for one 4 ½” strip. We will make & cut strip sets from the jelly roll (2 ½” strips) in class. HOMEWORK TO BE DONE BEFORE 2nd CLASS: Sew all your Dresden blades. We will sew the blades together in class and finish 1 of the 9 blocks in class. We will get as much done as time allows.